Shallots have a delicate and slightly sweet taste similar to both onions and garlic. Since purchasing market shallots tends to be expensive, gardeners are discovering the ease and simplicity of growing shallots themselves. Shallots offer the grower an inexpensive way to have a ready supply of this onion relative for a fraction of the store price. Shallots grow in a similar fashion to garlic. Gardeners are able to move shallots grown in containers to different locations to protect them from excessive heat. Shallots resemble large, brown garlic cloves. Prepare the shallot containers four to six weeks before the last frost. One shallot clove grows comfortably in a container 6 inches in diameter. The containers must have adequate drainage holes in the bottom. If the containers do not, use a drill bit on a power drill to make the required drainage holes. Fill the containers with a mixture containing equal parts potting soil and leaf mold. Substitute bagged compost, sold at garden centers, for the leaf mold if the organic matter is unavailable. Separate the individual shallot cloves from the larger shallot bulb with gentle pressure from your thumb. Insert one shallot clove, root-end downward, into the potting mixture. Plant the clove shallowly so the tip is level with the soil. Shallot cloves buried too deeply under the soil find it difficult to produce sprouts strong enough to break through. Transport the shallot containers to an area in full sun. Shallots prefer full sun but also thrive in partial shade if the afternoon heat of summer becomes extreme. Water the shallot cloves with a gentle spray to avoid displacing the soil and exposing more clove than necessary. Continue to water the shallots once per day to avoid the soil from drying out. Feed the shallots a diluted solution of general fertilizer during the middle of the growing season, following package instructions. Most fertilizer guidelines instruct you to use equal parts fertilizer and water for proper dilution. Harvest the shallots when the green foliage has yellowed and wilted over. 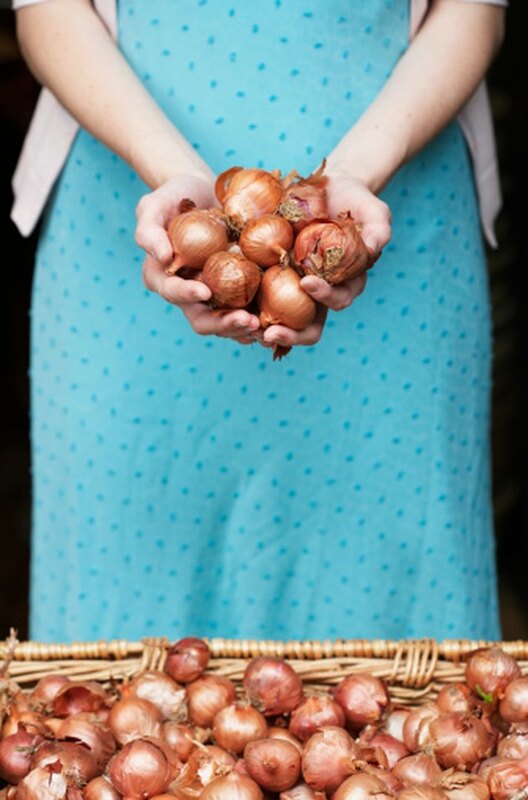 Scoop the shallot bulbs out of the soil by using your hands or a garden fork to raise them above the dirt. Dustin Alan began his writing career in 2000 where he was began writing for “Times Record." His work is featured in “Arkansas Home and Garden," “Green Thumb," Home Step Ahead and DIYImprove. Alan attended Arkansas State University and graduated in 2000 with a Bachelor of Arts in English.